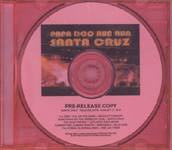 This is the new CD from Cupertino's Papa Doo Run Run. They've back Jan and Dean in studio and on stage, and play all over the place in their own right, delivering well crafted California Sound vocals that tell of sun and sand and girls. This disc sports ten rousing good-time beach songs all about Santa Cruz in that Beach Boys style. There is also a very nice instro called "The Giant Dipper," dedicated to the roller coaster on the Santa Cruz Beach Boardwalk. Unpretentious fun. Big hall drums and a warm guitar melody over dry harmonic glissandoes transcend an sixties-eighties-nineties-2000 sound that's just plain cool. It's not edgy, not hard driving, not pure surf, but it's very melodic and very listenable, and even more enjoyable.